Who received the Confucius Peace Prize last week? Despite appearances, the Confucius Peace Prize is not an outcome of Chinese government policy. 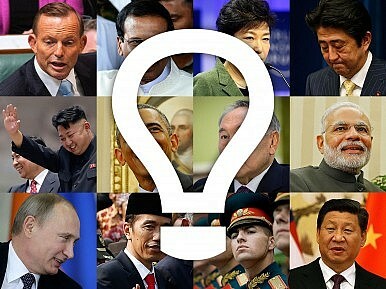 Which Asian leader was in Washington last week for a state visit? Pakistan’s Prime Minister Nawaz Sharif concluded his second official visit to the U.S. since assuming office in 2013. During his visit, Sharif met with Secretary of State John Kerry, addressed the U.S. Chamber of Commerce, and met with U.S. President Barack Obama. Sharif’s visit comes on the heels of the visit to the U.S. by Lt. Gen. Rizwan Akhtar, the chief of Pakistan’s Directorate for Inter-Services Intelligence (ISI). Sharif’s visit to the U.S. also comes at a time when his domestic position in Pakistan is significantly diminished. The Pakistan Army enjoys a monopoly on issues pertaining to national security, counter-terrorism, and relations with the U.S. and India. A few days prior to the Pakistani prime minister’s visit to the U.S., Sartaj Aziz, a confidante of Sharif, was replaced as the national security advisor by Lt. Gen. Naseer Khan Janjua, the former head of the Pakistan Army’s Southern Command. China announced its quarterly GDP growth figure last week. What was the growth rate of the Chinese economy in the last quarter? China’s latest gross domestic product (GDP) data has failed to placate fears over the health of the world’s second-biggest economy. Despite beating market expectations, the communist giant’s worst quarterly performance since 2009 has sparked calls for more action by Beijing to prevent an even bigger slowdown. Amid fears of another “China shock,” on Monday China’s National Bureau of Statistics announced a 6.9 percent rise in GDP during the third quarter, beating economists’ estimates of 6.8 percent but well ahead of more pessimistic forecasts. Per the U.S. Navy’s fiscal year 2016 plans, how many ships do the U.S. Navy and Marine Corps need to execute an “opposed amphibious assault” in the event of a war? The reason is simple. The U.S. Navy’s fiscal year 2016 30-year shipbuilding plan does not take into account the U.S. Navy’s and Marine Corps’ capability requirements for executing an “opposed amphibious assault” with two Marine expeditionary brigades (each brigade consists of roughly 14,000 men) in the event of war. According to U.S. Navy plans, conducting such combat operations would require a fleet of 38 vessels rather than the 30 amphibious assault ships currently in service. However, due to fiscal constraints, the navy compromised, requesting a mere 34 ships in the latest 30-year shipbuilding plan. “If 38 ships is the requirement … in the most engaging and most hard-to-fight plan, then that’s a reality. It’s not just a Marine Corps requirement. It’s a requirement for the nation and we ought to think about how we’re going to approach that,” Conant stated. How many countries has Xi Jinping visited since becoming the president of China? Which of the following countries did Japanese Prime Minister Shinzo Abe not visit last week? Japanese Prime Minister Shinzo Abe spent part of Thursday in the Mongolian capital, Ulaanbaatar, before heading off to Central Asia. Abe will spend the next week visiting capitals throughout the region with an entourage of Japanese business representatives looking to secure around two trillion yen ($16.5 billion) in deals. He’s the first Japanese Prime Minister to visit the former Soviet republics sinceJunichiro Koizumi traveled to Kazakhstan and Uzbekistan in 2006. Abe was last in Mongolia in 2013. What will the United States sell Pakistan per an agreement concluded during Pakistani Prime Minister Nawaz Sharif’s recent state visit to the United States? A Chinese firm was tapped to build a ‘city’ from scratch in which Asian country? Which Asian state is holding a major summit with all 54 African states in the last week of October 2015? After the United States, which country is the second largest contributor of troops to the NATO-led Resolute Support mission in Afghanistan?